Maxford USA QC-tests every CRRC engine, ignition module and even each of the sensor cables at our facility in Paramount California before shipment, and we assign each engine a unique serial number and provide in-house service exclusively for our customers, supported by our extensive inventory of spare parts. When you buy from Maxford USA, you are 100% sure of receiving a good engine. It comes with auto advanced electronic ignition (CDI), spark plug, velocity, side mount muffler, standoffs and manual. One year manufacturer's warrantee with in-house support by Maxford USA. 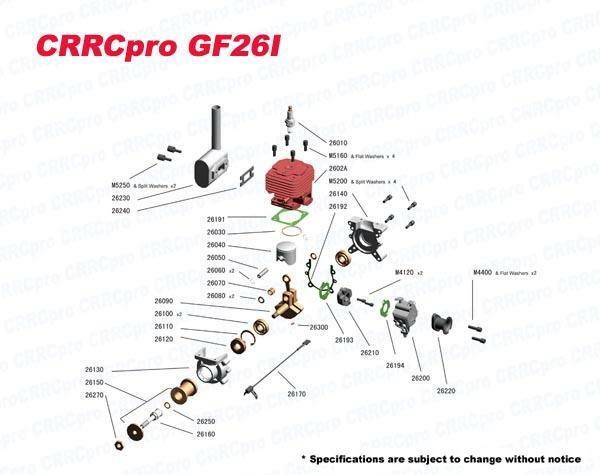 *If you need to replace Spark Plug, you may use NGK CMR7A. ** If you want to add a SPINNER, we have the 2.5" Spinner special designed for this engine with pre-cut opening for wood prop. If you want to get your own spinner, the prop shaft thread is M8. All our gasoline engines are “Quality Checked” (QC’ed) at the CRRC factory before shipment to us, and QC’ed again at the Maxford USA warehouse before being shipped to you. The QC process includes mounting the engine in a test stand and successfully starting and running the engine before it is finally packaged for shipment. Our gas engines are sold with a Limited Warranty which extends for 1 year from the date of purchase by the original consumer purchaser. Before you start the engine for the first time, to ensure proper care for your engine and to help keep it running reliably, fully read the “engine break-in” and related instructions packaged with the engine. 1. Make sure the spark plug is tightly mounted in the cylinder head and that the high-voltage module’s spark-plug connector is fully seated over the spark plug. 2. 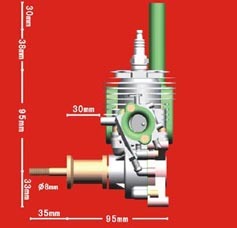 The ignition module must be shock-mounted and positioned so that it receives adequate cooling air. 3. Ensure the battery you connect to the ignition module has a capacity of at least 1,000 milliampere-hours, the battery is fully charged and that its terminal voltage measures between 4.8 volts and 6 volts DC. 4. You are responsible to supply and install a mechanical “kill switch” that is easily and safely accessible to disconnect the ignition module from the ignition module’s battery while your airplane is on the ground. 5. You are also responsible to supply and install a radio-operated “kill switch” to disconnect the ignition module from the ignition module’s battery while your airplane is airborne. 6. Use only balanced propellers; NEVER use a propeller that has a nick, dent or other damage. 7. Frequently check to ensure the engine is securely attached to your airplane, and check and re-tighten the prop. shaft, propeller and spinner as necessary. 8. Use a gasoline/oil mixture of between 20 and 25 to 1 during at least the first 15 hours of operation, and carefully follow ALL of your CRRC engine’s “break-in” instructions and precautions. 9. Since your new CRRC engine has been successfully test-run, be careful to note the position of each “out of the box” adjustment, and do NOT attempt readjusting any setting before ensuring you can return the engine to its original factory settings. 10. Do not void the warranty by attempting to modify the engine or attempting to repair a suspected problem. 1. If the engine misfires and/or runs erratically, check that the ignition module battery has a terminal voltage of between 4.8 volts and 6 volts DC. 2. The steps outlined in the instruction manual’s “troubleshooting” section are provided as a brief guide for performing non-warranty services. If your engine is still within the terms of Maxford USA’s Limited Warranty for Gas Engines you must obtain prior authorization from a Maxford USA service technician before attempting any in-depth troubleshoot procedures (such as readjustments to the carburetor, carburetor cleaning, and/or ignition timing readjustment). Any testing or using of this engine is done entirely at your own risk.